We've got a good feeling about this, Morty. After nearly a year of doubt and ambivalence, behind-the-scenes negotiations with network Adult Swim, and increasingly frequent outcries from an ever-fervid fanbase, Rick and Morty has landed a renewal no one expected to be as large as it is. Co-creator Justin Roiland confirmed on Thursday that Adult Swim has ordered 70 more episodes of the animated sci-fi comedy series. "More Rick and Morty coming. Looking forward to all the tweets asking where it is!" he wrote on Twitter, also sharing a hand-drawn photo of the eccentric genius Rick Sanchez and his perpetually nervous grandson Morty Smith (both voiced by Roiland himself). Working off the series' history of rolling out 10-episode seasons, fans are safe to assume that 70 additional episodes means Rick and Morty will debut seven more seasons under this renewal deal, bringing the total episode count to 100 — which means the show can be syndicated. Essentially, Rick and Morty will run for as close to the "100 years of Rick and Morty" Rick Sanchez rambled about in the pilot as possible. 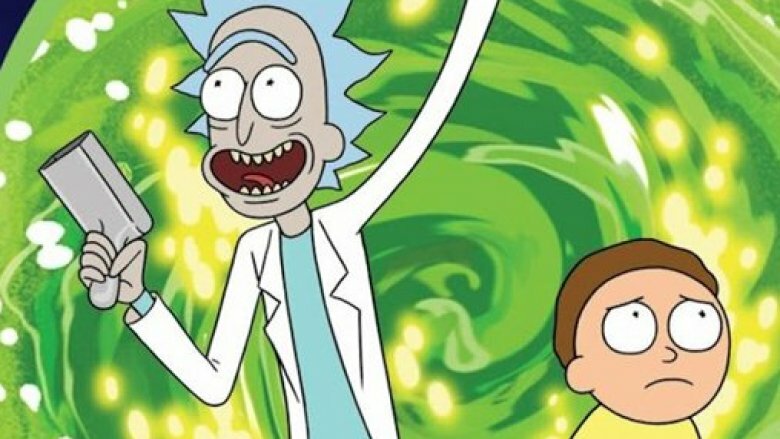 Though Roiland didn't mention when the long-awaited fourth season of Rick and Morty will premiere, how frequently new seasons are expected to launch, or how the episodes will be released, this announcement is likely more than enough to slap a huge smile across every fan's face. Amid the renewal news, Dan Harmon, the other half of the Rick and Morty creators team, got candid with GQ about the series getting such a massive pick-up — something his past endeavors, namely the ever-troubled sitcom Community, never received. "I'm feeling great. [I] had to make up my mind that this wasn't a guarantee, for the sake of my own emotional well-being. But now the deal is closed and it's official, so I can finally actually breathe and be as excited as I've wanted to be. I'm ecstatic," Harmon said. "Rick and Morty is definitely the most freeing, most fun thing I've ever worked on. It's had the biggest impact. I love everything I make — and hate it, I guess — but I have a very special relationship with Rick and Morty, and getting a 70-episode pickup means that I can actually really focus on it, and loving it won't be taking away from anything else. I can let Rick and Morty take away from everything." He continued, adding that the deal included everything he could have hoped for: "It was a lot of back and forth, but Justin [Roiland] and I just needed enough episodes and the right kind of deal structure that would give us permission to do what we want to do, which is truly focus on the show. We got all that, and we're both very excited." As for whether Harmon will be exclusively committed to Rick and Morty from here on out, he explained that his focus "probably won't immediately be 100 percent Rick and Morty," but the series will definitely be what he spends the majority of his creative energy on. "There [are] other projects that will need to be supervised and tended to, whether that means wrapping them up or minimizing my involvement in them. But yes — the deal that we arrived at is certainly one that justifies us focusing on the show exclusively. We'll be able to do other things, but the catch-as-catch-can, hand-to-mouth, wondering-what-my-future-holds days can finally draw to a close," Harmon noted. "I mean, 70 episodes is a lot of Rick and Morty to focus on. At the end of doing that, I'm not gonna feel like, 'Oh, d*** it, I should have been focusing on my landscaping business.'" Harmon ended the conversation by mentioning that he and Roiland "haven't sat down yet" to write Rick and Morty season 4, joking that they need a ton of coffee before they can get started. "We need coffee brewed at the office. That's the new reason. But that's a reason that can get tackled now, instead of 'I can't talk to you about it' or 'I don't know if it's ever gonna happen' and 'I can't even think about it or I'll go insane,'" he said with a laugh. "Now the reason can be, 'Oh, because it's Thursday. It's after 6 PM.' From now on, the reason that I'm not writing the show will be because I'm done writing it for the day and I'm having fun. That'll be nice." In all, Rick and Morty's recent renewal pretty much confirms it: Of the countless possible universes in existence, this is the best one to be in.